A letter from E. R. Trafford per William Beardall to Henry Shelton Sanford, dated June 22, 1884. In the letter, Trafford requested Sanford's signature for three enclosed deeds, two of which were in the City of Sanford, Florida, the third was near Henry Sanford's St. Gertrude's Grove. Trafford was a company agent for the Florida Land and Colonization Company (FLCC) from 1882 to 1886. He served as the company’s local representative, managing the company office in Sanford, Florida. He was selected by the board of the FLCC, despite resistance from the President and Chairman of the Board, Henry Shelton Sanford. Unlike his predecessor, James Ingraham, Trafford provided Henry Sanford with little confidential, first-hand information about events in Florida. As a result, Sanford regularly advocated for Trafford’s replacement. However, the company’s other board members, distrustful of Henry Sanford’s business acumen, retained Trafford precisely because his first loyalties remained with the company in London and not Henry Sanford. His tenure as FLCC agent is reflective of the often tense relationship between Henry Sanford and his fellow board members as well as the increasingly limited influence Sanford had in company affairs. The FLCC was a joint-stock venture that invested in Florida land development and sales in the 1880s and early 1890s. The company was formed by Henry Shelton Sanford with help from a group of British investors. Located at 13 Austin Friars in London, the company was officially registered in London on June 10, 1880. With the formation of the FLCC, all of Henry Sanford's Florida properties were transferred to the company in exchange for a ₤10,000 cash payment and another ₤50,000 in company stock. Sanford was named President and Chairman of the Board. In 1880, the company owned 26,000 acres scattered across Florida, including in the cities of Jacksonville, St. Augustine, and Sanford, as well as in Alachua and Marion counties. Almost from the outset, there was serious friction between the British board members and Henry Sanford. Disagreements erupted over business strategy, as Sanford frequently proposed initiatives deemed too bold for the cautious British investors. As a result of consistently meager profits from its inception, following Henry Sanford's death in 1891 many of the investors lost the motivation to continue. On September 15, 1892, the various directors acted to dissolve the company. Its assets, including roughly 65,000 acres of Florida land, were divided among shareholders. Original letter from E. R. Trafford per William Beardall to Henry Shelton Sanford, June 22, 1884: box 54, folder 18, subfolder 54.18.36, Henry Shelton Sanford Papers, General Henry S. Sanford Memorial Library, Sanford Museum, Sanford, Florida. 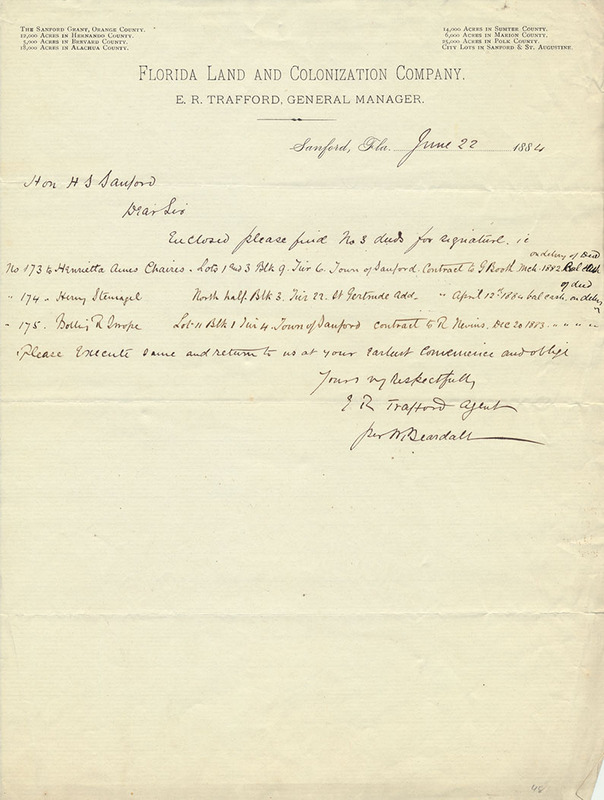 Digital reproduction of original letter from E. R. Trafford per William Beardall to Henry Shelton Sanford, June 22, 1884. Box 54, Folder 18, Henry Shelton Sanford Papers, General Henry S. Sanford Memorial Library, Sanford Museum, Sanford, Florida. Originally created by E. R. Trafford. Trafford, E. R. and Beardall, William. 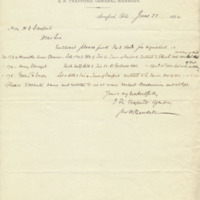 “Letter from E. R. Trafford per William Beardall to Henry Shelton Sanford (June 22, 1884).” RICHES of Central Florida accessed April 25, 2019, https://richesmi.cah.ucf.edu/omeka/items/show/7703.